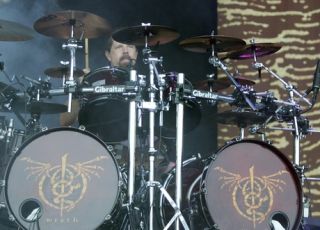 Chris Adler has taken time out from Lamb Of God's punishing tour schedule to talk drum hardware. Check out what the metal master had to say below. Adler, who is currently tearing up the US on the catchily-named Rockstar Energy Drink Mayhem festival, stepped aside backstage to talk to Gibraltar about his hardware set-up. Take a look at what he had to say below, if you can stop yourself staring at his beard blowing in the wind for long enough to concentrate on what's actually being said.